This classic 10 room, 2½ bath Tudor home with charming features and a great floor plan awaits your inspection. Throughout the home, you will find original quarter-sawn oak woodwork and lighting. A large foyer with tiled accents greets you as you enter. The foyer includes a built-in phone cabinet, coat closet, and arched doorways. Wide-board oak floors with butterfly joints add to the character of the foyer, living room and dining room. A convenient tiled ½ bath with linen closet adjoins the foyer. The living room and dining room are opposite each other, off the foyer. Enter through an archway to the oversized living room with a handsome wood burning fireplace. The fireplace is framed in white marble and the mantle edging is hand-carved. On either side of the fireplace, matching doors lead to the stone side porch. French doors greet you as you enter the large dining room which includes twin built-in corner china cabinets. A hall leads to a nice-sized kitchen with a built-in cupboard, plenty of cabinet space and new built-in dishwasher. The kitchen also includes a broom closet, a coat closet, and a convenient side door to the drive. A sunny breakfast nook is just off the kitchen. A wrought iron staircase, winds past a classic diamond-paned window at the landing to the four bedrooms and two full baths on the second floor. A wide, open hallway greets you at the top of the stairs. All four bedrooms and a full bath with linen closet open onto this central hall. The master bedroom with Rookwood gas fireplace and a nice closet connects to a hall with a linen closet. Off the hall is the tiled master bath with built-in shelves. The second bedroom has ample closet space, a laundry shoot, and built-in shelves. The third bedroom has two closets, built-in shelves, and connects to the large fourth bedroom. The third floor includes two nice-sized rooms suitable for bedrooms, office space or studios. A large walk-in cedar closet and roomy under-roof storage areas complete the third floor. The full basement includes a family room with gas fireplace, two storage rooms, laundry and furnace room, and toilet. The house is heated with a gas boiler and hot water radiated heat. Off the family room is a 2-car garage with an automatic door opener. The large and attractive back yard, with mature shade trees, is perfect for family gatherings and includes a newly installed 'invisible fence system'. 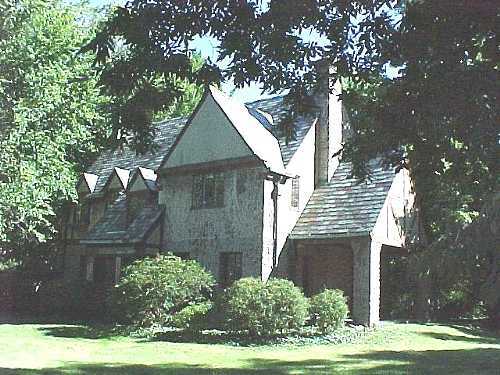 This stately Tudor needs updating and renovation. Years of quality family life have left her in need of some tender loving care. Don't miss this opportunity to purchase a quality home, deserving of your attention at public auction.